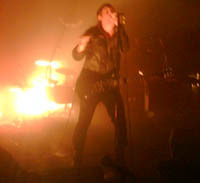 Nine Inch Nails has a reputation of being one hell of a live band. I can only agree with that. This has to be one of the best concerts I have ever seen. My expectations were ultra high and they were completely fulfilled. The stage setup was completely overloaded with gear and clearly indicated that Vega was one of the smallest venues on this tour. Great for us fans since it guaranteed perfect sound and vision. 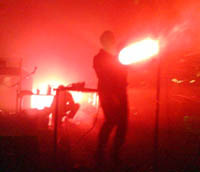 Trent and his backing group did a perfectly great job to set one hell of an industrial electro rock'n'roll party on fire playing mostly songs from the 2 ultimate NIN records "Broken" and "The downward spiral". Given the fact that the older songs are mostly out-of-this-world unbelieveably great it made good sense that the new album was only represented by "The beginning of the end" and "Survivalism", although they fit in perfectly with the older songs. The awesome "Hurt" once again reminded you exactly how great a songwriter Trent is. Absolutely outstanding in any way. "Gave up" reminded you exactly how much energy Trent is able to compress into a few minutes of music. The concert lasted for 1 hour and 30 minutes and it has to be one of the best ways to spend a Friday evening that you can think of.